Hurricane Irma put the recently completed Disaster Response Center in the Dominican Republic, to its ﬁrst test. Funded by a $100,000 grant from the ladies of the LWML, the solid, reinforced concrete ediﬁce is centrally located in a fertile valley, protected on all sides by mountains. Deadly hurricanes and earthquakes target the Caribbean on a regular basis, making this an ideal location for the multipurpose facility. 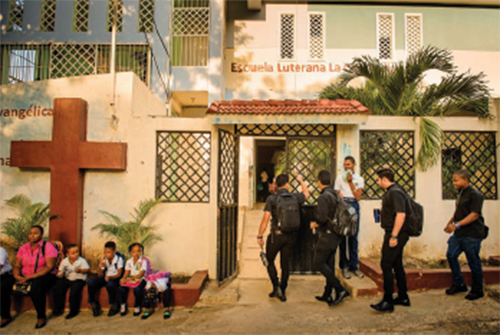 The Regional Office for LCMS Latin American Missions, located just six miles away, serves not only as the nerve center of mission work in Latin America, but also as the command center for disaster relief. Thanks be to God that Hurricane Irma was much less destructive than anyone imagined. However, preparation for this storm provided the perfect opportunity for a trial run, an opportunity to formulate a plan and execute it, while under the real life duress of an impending category five hurricane — the most powerful ever to come out of the Atlantic. Hand-in-hand the Body of Christ in the Dominican Republic worked. People from different countries, languages, abilities, ages, and skin colors came together with joy to accomplish the task at hand. Indeed, the intensity and camaraderie was something most people never see in a lifetime. Supplies were hauled in by the van load. Water, rice, canned meat, sugar, oatmeal, dry beans, hygiene supplies, and other items were packaged and prepared for mass distribution following the hurricane. Hours passed in the ninety-plus degree heat. Electric fans would have been a welcomed luxury, but cooling came only from sweat soaked shirts and gulped bottles of water. Near the end of the day, as energy was waning and hands were faltering, the singing began. Throughout the building, the sounds of happy voices singing praises to our God rang out loudly and clearly. The joyful sounds could be heard until the last of the supplies were packed safely away or loaded and hauled to other mission sites nearby. As the hurricane approached the island, the Disaster Response Center was made available for anyone in the community who needed assistance or shelter from the storm. This, the first of many coming disaster preparations, would not have been possible were it not for this structure, large enough for massive preparation, while also solid and secure enough to be a shelter in the storm. We thank God for the dear ladies of the LWML for providing such a facility, so that God’s goodness and mercy could be shared with those in Latin America. Indeed, so we might also teach others what we do as the Body of Christ: we show love to our neighbor. Concordia the Reformer Mercy Center and Seminary also serves as a center for training deaconesses for human care and mercy ministry. More than 100 women across Latin America are enrolled in deaconess classes, many of whom receive training here. In addition, on September 11th, the first class of seminarians attended the opening chapel service in this facility. We pray these students will become faithful shepherds. Dedication of Concordia the Reformer Mercy Center and Seminary was held on October 1, 2017. No doubt, future generations of faithful pastors and deaconesses, and the people they serve, will look back and say, “Thank God for the forward-looking, generous, and godly women of the LWML.” Indeed, each little mite, lovingly collected, and each prayer spoken in faith, was blessed by Our Father, who does all things well. This story was originally featured in the Winter 2017 Lutheran Woman's Quarterly. Order your subscription here.